1. Do you often do any cooking? 3. 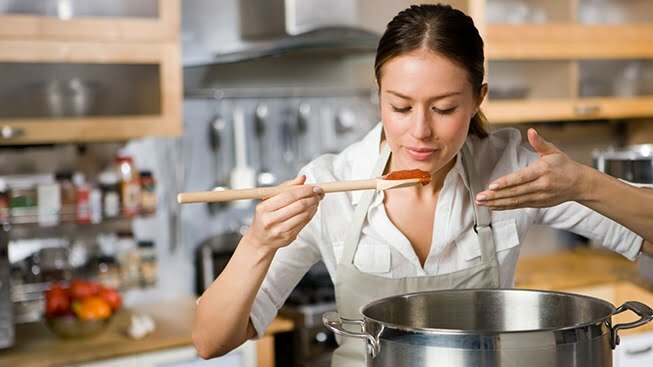 What cooking experience have you had? 4. Who taught you to cook? 5. When you were a child, did you ever help your parents to prepare a meal? 6. Do you think children should help their parents prepare meals? Normally I don’t frequently cook at home on weekdays because I have no time. But on weekends, I usually cook food at home for my family. Yes, I’m quite into cooking because I believe that good dinner could guarantee our health and also I’m a foodie, I’d like to taste all kinds of tasty food. I always do some cooking in my home with my family during the weekend to enjoy the family time. Obviously, in my opinion, a fabulous cooking can’t be done without fresh food resources. So I always try to go to the super market early in the morning and select today’s vegetables and meat. Besides, I always put several vegetables such as carrot, bamboo shoots, pepper, tofu, along with meat to cook in order to get the balanced diet. My mother is an expert at cooking, and she taught me how to cook when I graduated from university and started to live independently. She told me that the ability to cook was fairly important because good dinner could guarantee our health. I remember when I was a little boy, I was used to help wash the vegetables, go out to buy some flavours, etc. I strongly recommend that children should take part in this kind of housework because it can help cultivate the hands-on abilities, a sense of achievement and even learn some table manners.